If you choose to download the portable zip version of a program, for example Sublime Text 2, then you might be missing out on the neat feature of having it added to the right-click context menu in Windows. This can be added through editing the registry. 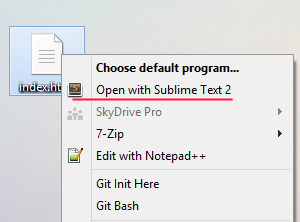 Double click the (Default) string inside the newly created “command” folder, and enter the path to your program, in this case, Sublime text 2: C:\dev\SublimeText2.0\sublime_text.exe "%1" Make sure you also enter "%1", including the quotes. If you now right-click a file, you should see the “Open with your program” option in the context menu. Right-click a file, and see if your icon is showing! You could also save the text below as a .reg file, and run it.